As I began to research the history of the site, I discovered that someone had already given much thought to how the empty lot could be used by the residents of Pointe Saint-Charles. In the summer of 1972, two young students from McGill University’s School of Architecture, Pieter Sijpkis and Joe Carter, initiated their own extensive intervention project on the site. Entitled “Adventure Playgrounds / Green Thumbs, Sore Thumbs,” their two-part project involved the conversion of the empty lot into a giant play space for children to enjoy. In order to accomplish this, they received funding from a federal agency that in turn allowed them create employment opportunities for local residents to assist in construction and administration duties at a time when the neighborhood was considered one of the most disadvantaged in the country. The second part of Sijpkes’ and Carter’s project involved the conversion of several other empty lots in the neighborhood into small community gardens, and as it turned out, my colleague, Laura O’Brien, had chosen one of those sites as the focus of her own research. Since our sites of interest had such a significant historical link, she and I decided to combine our efforts and collaborate on a single urban intervention project that would unite our research. The collaborative intervention project that Laura and I conducted involved three parts: Historical research, creative production, and a guided activity at the empty lot on Bourgeois street. A major aspect of our historical research involved interviewing both Pieter Sijpkes and Joe Carter – the interviews were a fantastic opportunity to hear fist-hand about the experience of conducting an urban intervention project in the 1970s, and about how the Pointe has (and has not) changed between then and now. It was an extraordinary coincidence that the sites Laura and I were interested in had already been the subject of an urban intervention project several decades earlier, but upon hearing Sijpkes’ and Carter’s memories of their own experience working in the Pointe, it seemed all the more meaningful that the sites, which had been locations of such vibrant activity during the summer of 1972, seemed to have reverted to a state of relative disuse. As our research progressed, it became clear that our intervention would address the issue of accessibility. While Laura’s research gravitated towards the ideas of safety and danger, I became interested in ideas of collective knowledge and discovery. We both wanted to get residents of the neighborhood interested in and excited about accessing each of the sites we were researching, and as a first step we decided to clean both sites of as much garbage and debris as possible – we wanted residents who may not have noticed these sites before to encounter them for the first time on a positive note. Once the sites had been cleared of as much garbage as was possible, we moved on to the creation part of our intervention. 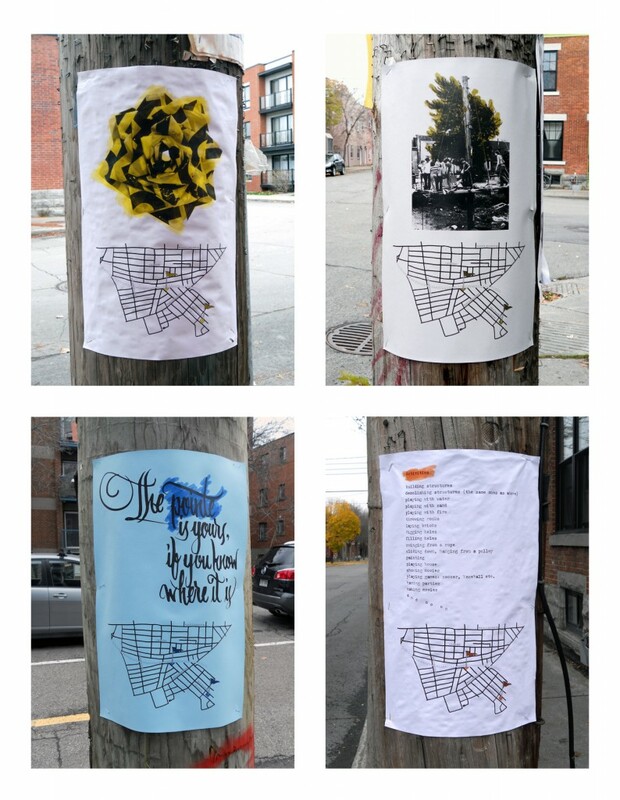 I produced a series of four posters that were put up throughout Pointe Saint-Charles – each poster featured a small illustration and a hand-drawn map of the Pointe with the location of each site marked with a little flag. The posters contained no other information, and were designed to pique the interest of passersby in order to turn the discovery of the sites into an unexpected and perhaps even enchanting experience. 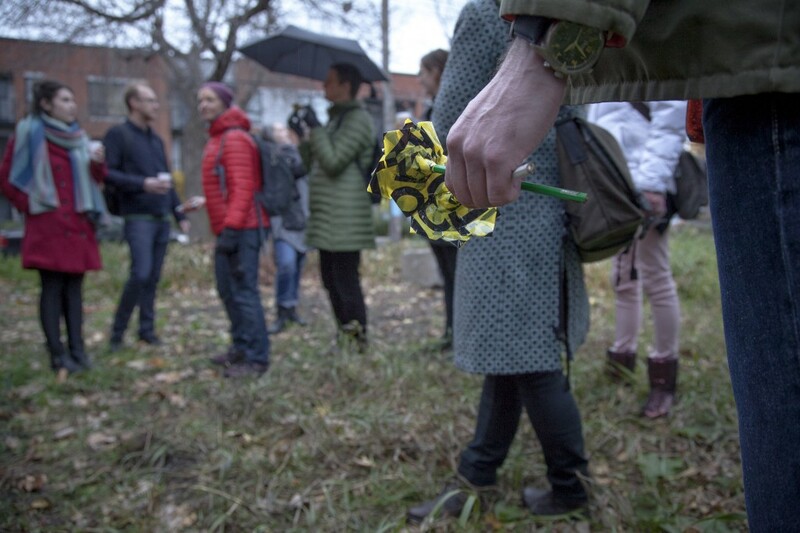 On the afternoon of November 6th, we staged a one-day activity that began at the site Laura had been researching and, following a short walk through the neighborhood, ended up at the empty lot at the end of Bourgeois street. Once we arrive at the site, I gave a brief discussion of its history, and then invited everyone who had joined us to participate in an activity designed to familiarize them with the physical layout and tactile experience of the site. Laura had created twenty small flowers out of danger tape (an idea that came out of her research) and we had hidden them throughout the site – everyone set out to explore the terrain and find a flower. Once all the flowers had all been found, we encouraged everyone to plant them all at the edge of the site, as a simple gesture to both catch the attention of passersby and to identify the site of one capable of accommodating any number of creative uses by anyone willing to simply step foot into it. The activity was followed by a cup of hot apple cider and a lively discussion with two special guests that we had invited to join us, Pieter Sijpkes and Joe Carter. It remains to be seen how the residents will use the sites that Laura and I tried to draw attention to through our intervention, but if our occasional discussions with residents who were curious about what we were up to are any indication, there is definitely an interest in preserving and activating shared space in Pointe Saint-Charles, especially within the context of ongoing urban renewal and development. Our intervention project would not have been possible without the contributions and assistance of the many residents of Pointe Saint Charles we encountered during our research and creation activities, including Mark for discussing the history of the CN railway with us, Diane for facilitating our on-site activity, Emma from Share the Warmth for contributing equipment for use during our activity, and of course Pieter Sijpkes and Joe Baker for so generously sharing their time and their stories with us.